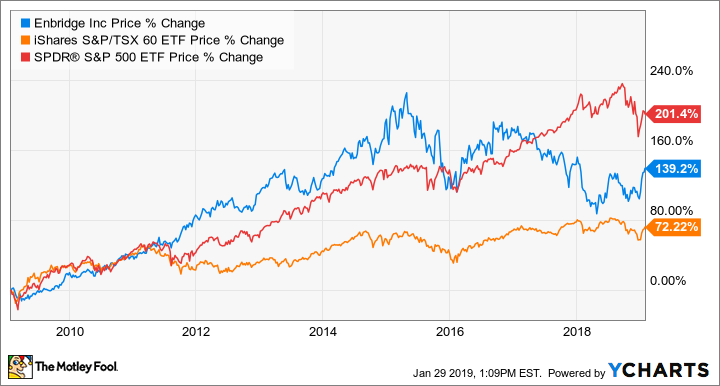 The Motley Fool Canada » Dividend Stocks » Is This Solid Dividend-Growth Stock About to Turn Around? Is This Solid Dividend-Growth Stock About to Turn Around? Enbridge (TSX:ENB)(NYSE:ENB) has a track record of delivering value for shareholders. Since right before the last recession, Enbridge’s operating cash flow per share has increased by about 11.2% per year. The cash flow growth has driven dividend-per-share growth of almost 14.4% per year in the period, which equates to almost 4.4 times what the dividend was at the start of the period. So, if you’d received $1,000 of dividend income from the stock about 11 years ago, you’d now receive almost $4,400. In the period, the annualized rate of return of Enbridge was about 11.1%. Enbridge (TSX:ENB)(NYSE:ENB) has a track record of delivering value for shareholders. Since right before the last recession, Enbridge’s operating cash flow per share has increased by about 11.2% per year. The cash flow growth has driven dividend-per-share growth of almost 14.4% per year in the period, which equates to almost 4.4 times what the dividend was at the start of the period. So, if you’d received $1,000 of dividend income from the stock about 11 years ago, you’d now receive almost $4,400. In the period, the annualized rate of return of Enbridge was about 11.1%. ENB data by YCharts. The 10-year price action of Enbridge, the U.S. stock market, and the Canadian stock market. It’s true that recently Enbridge has had some hiccups after merging with Spectra Energy in February 2017. From peak to trough, the stock fell as much as 30% in the year and two months that followed. Given the size of the acquisition, a $28 billion merger, Enbridge has actually been doing a pretty good job. There have been much worse acquisitions in the past. Is Enbridge stock about to turn around? Enbridge stock may be basing and on the verge of a turnaround. In 2018, Enbridge sold $7.8 billion of non-core assets, which helped it to deleverage its balance sheet, bringing its debt-to-EBITDA ratio down to the 4.7 times target. Enbridge also suspended the dividend-reinvestment plan, which indicated that it didn’t need that extra buffer of cash flow to fund growth or reduce debt. In 2018, it successfully put about $7 billion of projects into service, which more or less offset the cash flow lost from the non-core asset sales. And for 2019 through 2020, Enbridge has another $16 billion of commercially secured projects to drive near-term growth. Furthermore, the company is on track to achieve $540 million of synergy target from the integration of Spectra Energy. Enbridge is putting things in order, and a stock price back to the $60 level is possible over the next two years, barring a stock market meltdown. This would imply an annualized rate of return of about 17.5% from the $48.30 per share level today. This estimated return is thanks partly to its juicy dividend yield of 6.1%. After combining with Spectra Energy, Enbridge now has three core businesses: a stable U.S. gas transmission business, the liquids Mainline system, and a gas utility. The long-term global demand for crude oil and natural gas is expected to grow as will natural gas demand in North America, and Enbridge’s critical energy infrastructure is there to meet the demands. All the while, it’s going to offer a solid, growing dividend. Fool contributor Kay Ng owns shares of Enbridge. Enbridge is a recommendation of Stock Advisor Canada.